010-3075847 (MO - FR 9:00 - 17:00) Contact via e-mail is preferred. We strive to answer your request within 2 business days. The tram has been a fixed icon in Rotterdam's streets for many years. When in the tram, you can see the city pass you by. In the RotterTram you do that very comfortably and whilst enjoying a culinary 4-course dinner with accompanying beverage arrangement. Reservations can be made for a table of 2 or 4 people or by hiring a half (20 or 24 places) or an entire tram (44 places). Look here for business opportunities. Until 2004 the 1629 operated for the RET as a passenger tram, then it became an instructional trait. In 2016, the RET made this tram available for the RotterTram project. The tram was then completely stripped, after which the construction-team converted the tram into a full tramrestaurant in three months. An inverter has been installed that can convert the current from the overhead line (600 Volt) into usable electricity for, among other things, the kitchen equipment and lighting on board (230 Volt). The new interior is custom-made, the exterior is (just like in the old days) completely hand-painted in the famous Rotterdam colours green-white-green. As a basis for the construction drawings and the interior design, a 3D scan of the tram was made. In two weeks’ time the tram was completely stripped and the furniture, the windows, doors and stickers were removed. 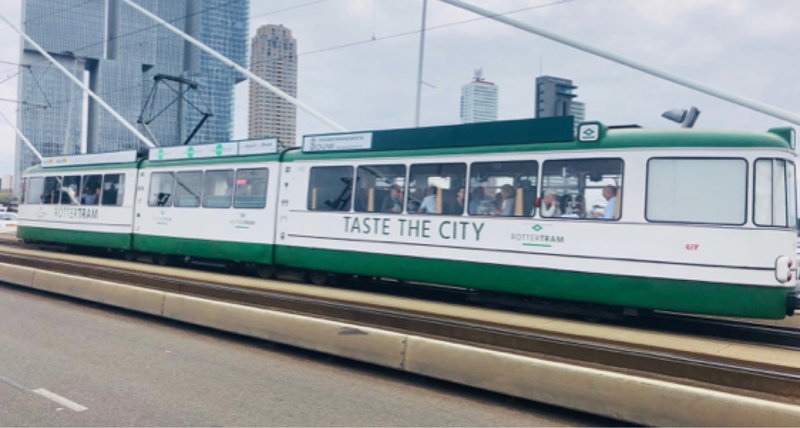 "With the RotterTram I want to show Rotterdam to as many people as possible in a fun and unique way. I am proud of our city, it’s history and public transport. With the RotterTram I can share this pride and offer as many guests as possible the opportunity to share a unique experience with the people they care about. As far as I am concerned, Rotterdam has the most beautiful skyline, but it will only be complete when the RotterTram drives over the Erasmus Bridge." Influences from the city of Rotterdam are combined with industrial and historical characteristics. All the interior in the RotterTram is custom made and therefore unique. A ride in the RotterTram is a fun event with colleagues or relations. That is why we offer a number of business packages. It is also possible to rent advertising space at the top of the tram for a minimum period of 6 months. An application is assessed on the extent to which the logo fits the RotterTram and the other advertisements. Contact us for more information on the possibilities. Company logo on the screens in the reserved part of the tram. (MO - FR 9:00 - 17:00) Contact via e-mail is preferred. We strive to answer your request within 2 business days.